How often should it be done? Most manufacturers recommend sterndrive/drive unit maintenance every 50 hours. To most boaters this equates to once per season. 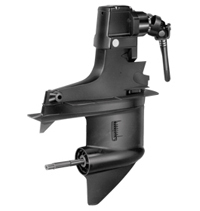 Usually the best time to perform this service is the same time that you winterize your boat. If you exceed 50 hours a season then it is advisable to stick to the 50-hour recommendation and additionally service your drive when you winterize at the end of the season. Servicing your drive not only performs a required maintenance function but it also can give you insight into the condition of your internal drive components. Water is a major enemy of drive units. Water in a unit, that has been recently run, will cause the oil to look milky. A unit that has set for a few days and had time to separate will drain water first and then the oil. Remember oil floats on water. Also check the tip of your magnetized drain plug and the oil itself for metallic shavings. Its not abnormal to have some very fine particles, demonstrating normal wear or break in, but larger pieces are a sign of serious problems. Any indication of water or excessive metallic fines should be brought to the attention of a qualified marine mechanic immediately. It also important to stress the absolute need to follow drive service recommendations for new drive units. This even applies to older boats that have had their drives rebuilt, replaced or repaired. Manufacturers recommend a 20-hour break in period at no more than 2/3 throttle and no extended high rpm runs. At the end of the twenty hours, service your drive unit as suggested in this bulletin. This time you can expect to see more metallic fines. This is normal, as the gears are seating and rounding off some of their square edges. Drive servicing is very cost effective. Think of it as an insurance policy. A few dollars worth of oil to protect a unit that can sometimes cost thousands of dollars to replace. Copyright © 2019 GLM Products, Inc. All Rights Reserved.